A SpaceX Falcon 9 rocket carrying a Bulgarian communications satellite launched on June 23, 2017. SpaceX is scheduled to launch another Falcon 9 rocket on July 2. This Sunday (July 2), SpaceX is scheduled to launch its third Falcon 9 rocket in just under 10 days, following launches on June 23 and 25. The Falcon 9 is scheduled to take off from Launch Complex 39A at NASA's Kennedy Space Center in Florida carrying Intelsat 35e, a broadband communications satellite. Spaceflight Now reports that the launch window will open at 7:36 p.m. EDT (2336 GMT). SpaceX confirmed that a second launch window will open on Monday (July 3), if Sunday's launch is delayed. On June 23, after a four-day delay, the company launched a Bulgarian communications satellite into space using a pre-flown first stage booster. On June 25, the company launched 10 communications satellites into orbit for the company Iridium as part of its Iridium NEXT constellation. 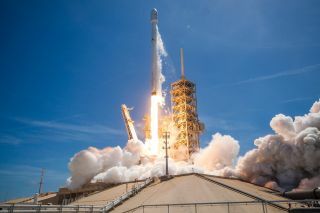 SpaceX representatives have said that the company has a backlog of more than 70 missions, worth more than $10 billion. Editor's Note: This article previously stated that Launch Complex 39A is part of Cape Canaveral Air Force Station; it is part of NASA's Kennedy Space Center.